Facing community outrage over federal actions to weaken the full cleanup of the Santa Susana Field Laboratory (SSFL), federal officials say they will nonetheless stay the course with a health assessment of SSFL. 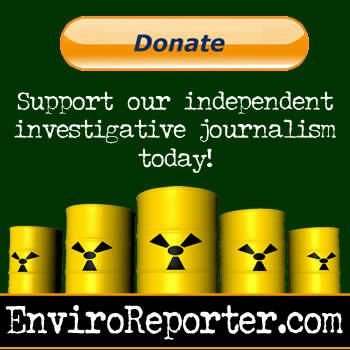 The new study was requested by a Department of Energy contractor who denies health impacts from the contaminated site and opposes full cleanup, as reported by EnviroReporter.com in Feds conspire to gut Santa Susana Field Lab cleanup on September 18. Responding to questions in follow-up to EnviroReporter.com’s exposé, the Agency for Toxic Substances Disease Registry (ATSDR) said it had put its controversial plans to review past SSFL health studies on hold before reversing itself twice, finally saying it was pushing ahead in a confusing statement. ATSDR’s plans include reanalyzing and reinterpreting two independent health studies that found evidence of contamination migrating offsite and elevated cancers near the lab, site of numerous radiological and chemical accidents, spills, dumping and burning. Then to confuse matters even more, the agency reversed itself again before coming up with a new justification for re-evaluating SSFL health studies at the behest of Abe Weitzberg, an anti-cleanup contractor for one of the responsible polluting parties, the Department of Energy. Actually, that “understandable, clear information” has been around for years. This reporter’s 2006 Los Angeles ValleyBeat story The Fallout laid out the story in pretty understandable language, including the reason the studies under attack were carried out by independent experts and not the federal government. “The new studies were commissioned in 2000 by the state Agency for Toxic Substances and Disease Registry, at a cost of $700,000, after ATSDR had outraged the community by performing a month-long preliminary review the year before and declaring that SSFL chemicals and radiation were harmless to locals,” the article said showing that 16 years later the agency is still up to its old tricks. Not surprisingly, Boeing was delighted at the ATSDR coming to town and took the opportunity to say so in a letter sent to community members and elected officials. Since many people who live near the site do not buy what Boeing or DTSC says, the company was pleased to announce ATSDR as a new player who will probably also tell area folks not to worry. Not so, says longtime SSFL cleanup advocate Dan Hirsch, a professor of nuclear policy at UC Santa Cruz and president of the government watchdog organization Committee to Bridge the Gap. Not if that future resident has a garden and eats vegetables and fruit from it. Hirsch’s eagle eye has uncovered new information buried in thousands of pages of Boeing reports that shows that massively contaminated parts of the lab are so drenched in chemicals as to make them incredibly dangerous for anyone who might live there in the future under current zoning laws. Boeing is trying to relieve itself of cleaning up to the agricultural standards for which it is zoned, one of its main goals since inaugurating its greenwashing and astroturfing campaign in 2012. Using Boeing’s own numbers, Hirsch found that the current estimated lifetime cancer risk for soil exposure at the former Environmental Effects Laboratory at SSFL is a staggering one in three, meaning one in three people exposed could be expected to get cancer within 30 years living there and eating out of their garden. The same scenario at the Systems Test Laboratory IV would yield almost an absolute certainty that the person would die from the chemical goo in that Rocketdyne soil: 96 percent chance of death. [Environmental Effects Laboratory report: 14.3 MB See pages 622 (last two paragraphs; “ELCR” means “estimated lifetime cancer risk”), 641 and 847. Both areas sit at the headwaters of the Los Angeles River. And both areas will be cleaned so that, in the same scenario, two in ten would get a fatal cancer from the dirt after Boeing’s desired cleanup. Typically, the EPA reaches for a one in a million cancer risk. Boeing’s level would be 200,000 times EPA’s standard optimal goal. Hirsch also recently showed to a Simi Valley audience Boeing maps of the site revealing that much of the property was due to be written off as “NFA” meaning “no further action”. In other words, not cleaned up at all. He noted that there is only a short window of time until the state Department of Toxic Substances Control (DTSC) signs off on Boeing’s proposal. This shocking information was presented at the September 24 meeting of the SSFL Work Group at the Simi Valley Cultural Arts Center. A standing room only crowd gathered into the center to watch KNBC’s I-Team investigation of SSFL called LA’s Nuclear Secret which began earlier in the week. 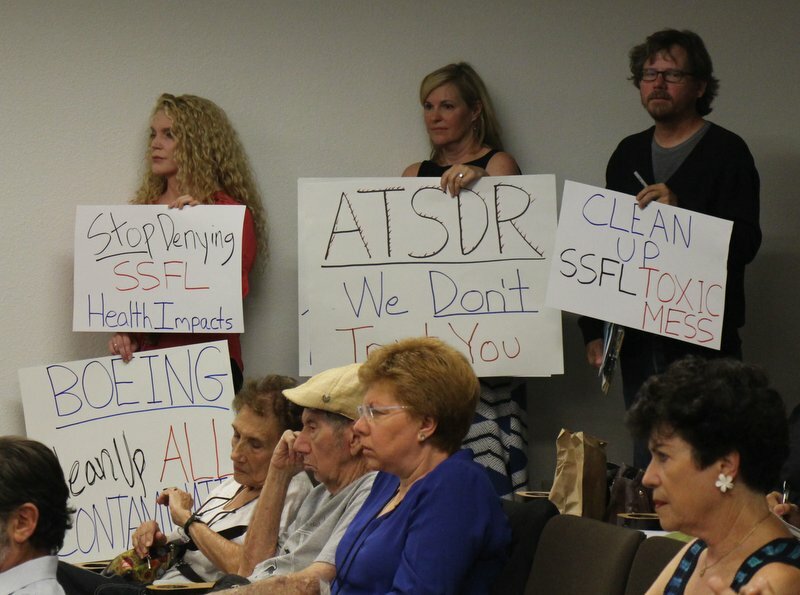 The audience, which included many of the victims of diseases blamed on SSFL contamination who were featured in the investigation, were shocked, angered and determined to demand full cleanup of the lab after watching the investigation again. 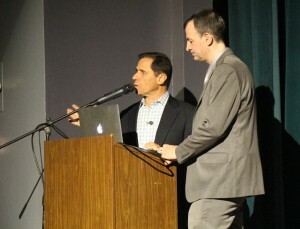 They expressed gratitude to investigative television journalist Joel Grover and producer Matthew Glasser. KNBC’s I-Team Joel Grover and Matthew Glasser at SSFL Work Group meeting Sept. 24, 2015. Jessica Gesell at Sept. 24, 2015 SSFL Work Group. 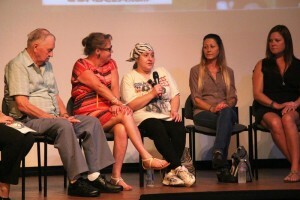 Denise Dardarian with microphone with Ralph Powell, far left, and other survivors. Indeed, thousands of folks who never had heard of the Santa Susana Field Laboratory know all about it now. 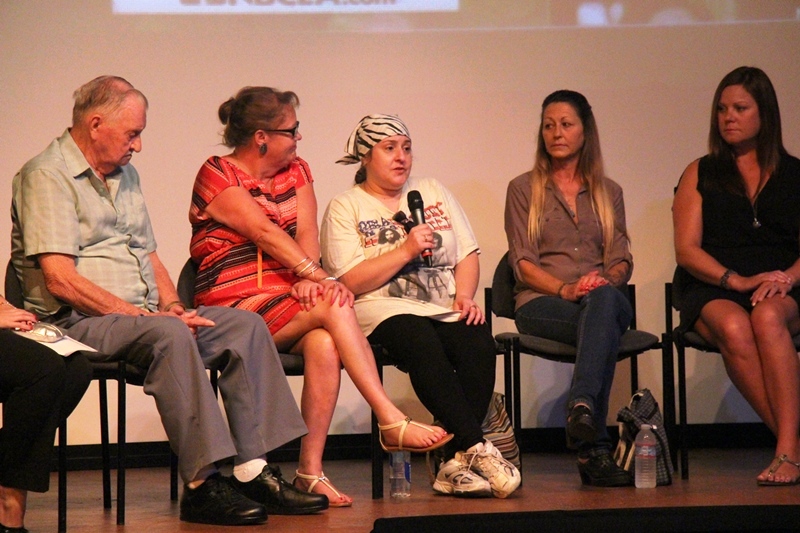 Others like Denise Dardarian were newly motivated to speak out. Just that day she found out good and bad news and was brave enough to share it with a group of strangers, well almost strangers, as the people Grover interviewed have now bonded together and are joined in wanting to fight for full cleanup. Dardarian , Powell and Gassel are just a handful of Southern Californians who think SSFL has made them sick and killed friends and family and who want the contamination removed. A new online petition by the Rocketdyne Cleanup Petition urging elected officials to demand that cleanup commitments be kept has over 1,400 signatures. The cleanup is what the ATSDR study is truly about. If Boeing and the government can deny there is any risk from SSFL contamination, then they can also declare there is no reason to clean it up. 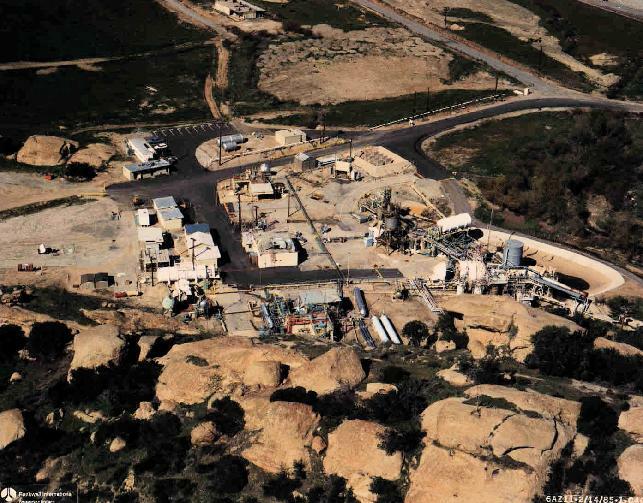 The ATSDR petitioner and anti-cleanup agitator, Abe Weitzberg, tried his hand at explaining away the old Rocketdyne’s lab’s extensive radiological pollution by simply spinning new yarns in the September 27 opinion pages of the Ventura County Star. 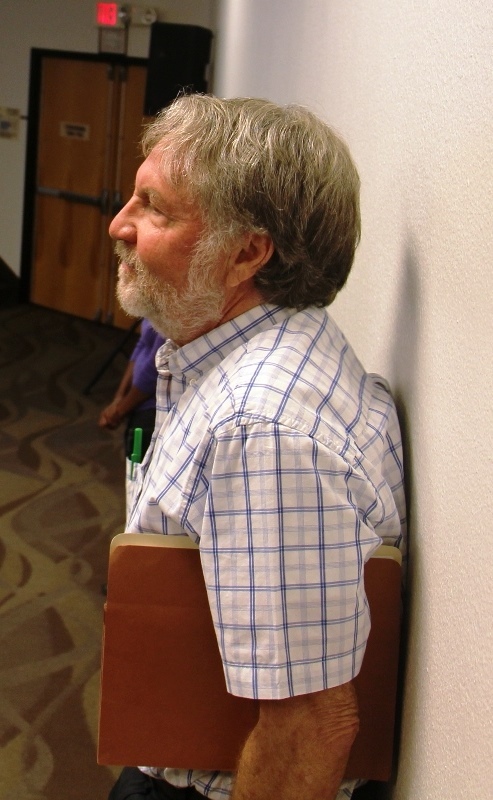 Abe Weitzberg at 8 Sept 2015 DTSC-ATSDR meeting which saw community protests against DOE contractor’s petition. In his Ventura County Star op-ed, Weitzberg also makes the claim that Dan Hirsch of Committee to Bridge the Gap “directed” the UCLA and University of Michigan studies. This is one of Weitzberg’s 100-proof fibs, long on moon and short on shine, and an affront to both of these leading universities and their researchers. Perhaps Weitzberg’s biggest op-ed whopper involved the Sodium Reactor Experiment. “The SRE facility was removed long ago and excavated to bedrock. EPA found very little radiological contamination and none that could be traced to the SRE accident,” Weitzberg wrote referring to the Sodium Reactor Experiment which partially melted down in 1959. The ATSDR hoax “study” may seem convincing. Persuade the public and elected officials that ATSDR can give them definitive information about current risks, spend a few months and a little money on the study, then give the all clear. Everyone can relax. No risk, no cleanup, no problem. Unwarm welcome for ATSDR Sept. 8, 2015. That might sound good to those looking for reassurance, until one considers the source. The U.S. EPA just spent over 41.5 million dollars of stimulus money on a radiological survey for just one area of SSFL, Area IV. ATSDR simply does not have the budget, capacity, expertise or credibility for extensive offsite testing. And then, as the authors of the UCLA and University of Michigan studies, cleanup advocates, community members and workers advocates state in letters of protest to ATSDR, there is the matter of conflict of interest. For twenty-five years, they say, the federal government has agreed to stay away from health studies of SSFL due to a conflict of interest in establishing whether its own activities caused harm. Now, ATSDR is breaking that agreement. Pointing to independent health studies already conducted and cleanup agreements already in place, cleanup advocates conclude that the only reason ATSDR is getting involved at this time, at the request of cleanup opponents, is to help the responsible parties get out of their cleanup commitments. Such help could be worth hundreds of millions of dollars. This is what Boeing and those who want to help them get out of cleaning up their contamination are counting on. Whether or not elected officials, many of whom will soon meet with the ATSDR director, buy into the health study hoax remains to be seen. The SSFL community just has to look at the BS that ATSDR is pulling at the radioactive fire at the West Lake landfill in Missouri to know what to expect from this crooked agency. 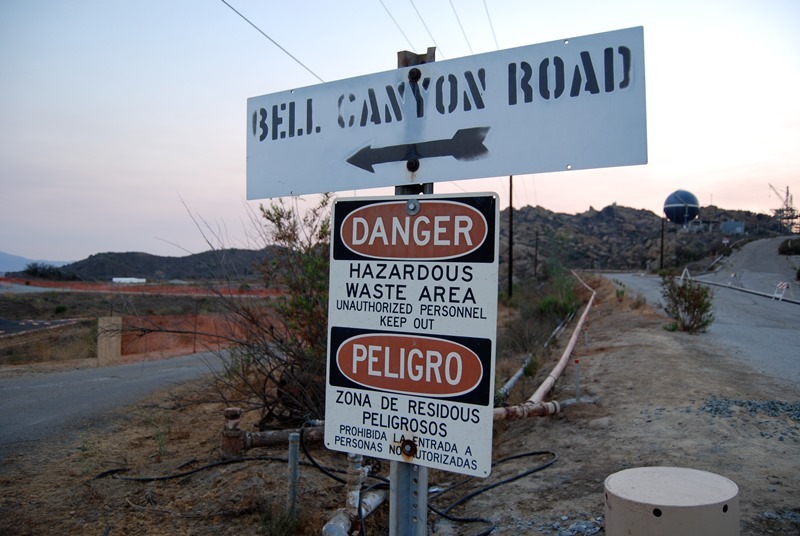 The Los Angeles Times reported last month that ATSDR concluded “radon levels at the landfill are below levels thought to be dangerous to human health” – but, get this – it would be too dangerous to clean up! See http://www.latimes.com/nation/la-na-nuclear-fire-20151020-story.html This is a page from Boeing’s playbook and exactly what it wants ATSDR to say re SSFL. And, just as noted the 2009 Congressional report, ATSDR also does deeply flawed and crappy work. The Missouri Coalition for the Environment raised a bunch of issues with the quality of ATSDR’s report. See http://moenvironment.org/files/ATSDR_HealthConsultationConcerns_Oct2015.pdf The Coalition states, “The ATSDR did not consider food/agriculture as a possible pathway at the West Lake Landfill even though ATSDR describes how these are possible pathways. Of particular concern, the ATSDR did not take into consideration water use for agriculture. The groundwater conclusions reached by the ATSDR only review public drinking water supply.” and “The ATSDR, when reviewing radioactivity in groundwater, only uses averages to assess the contamination (pg. 13). This is troubling because it minimizes the real changes in radioactive contamination of the groundwater over time.” It goes on, and on, sadly. It was bad enough to have the corrupt DTSC, DOE, NASA, and of course Boeing – now adding ATSDR another rotten federal agency to SSFL – who was asked to come in by those with a clear motive to destroy the cleanup – well, don’t be surprised when Simi and Ventura County in general keep seeing those rare cancers, generation after generation. Shameful, just shameful! Rocketdyne Clean Up Coalition is collecting signatures on a petition to tell the ATSDR to back off, and that their study is not needed. The petition allows the people signing it online to type a comment. Signer/Commenter #528 blew me away with what he had to say. His name is Yuri Stavitsky (M.D., Ph.D.) and his address in the 93063 part of Simi Valley. He is real. I checked him out. “I am a medical professional who actively participated in the efforts for elimination of the consequences of the radioactive contamination in Chernobyl immediately after the history’s worst nuclear disaster in 1986. I am deeply concerned and troubled by the situation around the continuously stalled cleanup of the SSFL site. There is no need for any new health risk studies or for a revision of the previous ones. The text book science is that any radiation in excess of the background levels is bad and needs to be eliminated. Tests conducted at the site showed very significantly elevated radioactivity levels as well as a dangerous radionuclide/emitter composition. They, in combination with the close proximity to the high density residential areas of Simi Valley and San Fernando Valley, leave no other options or choices but to clean the site up thoroughly and carefully and all the way down to the background levels, which were present before any radioactive or toxic materials were brought there. There is simply no other way. Any calls for a revision of the previous health risk studies as well as for new studies of the common or rare cancers incidence in the surrounding areas, and efforts to change the very concept of the background levels by any entity or agency, can only be viewed as efforts to further stall or prevent the cleanup. Dr. Stavitsky knows what he is talking about. He graduated from Kiev National Medical School. Kiev is about 44 miles south of the site of the Chernobyl nuclear accident site. All over Ukraine, Belarus and Southwest Russia people die of horrible radiation-related cancers which they call “Chernobyl Disease”. Everybody knows what they’re talking about and there are few if any industry pandering shills running around those countries saying “Nothing happened”. 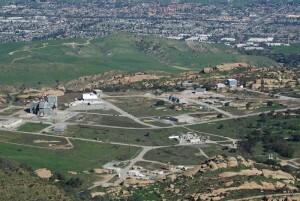 Perhaps as people from communities surrounding the Santa Susana Field Lab continue to become ill and die from radiation-related cancer, folks in those communities should start calling the multiplicity of radiation-related diseases in these surrounding Southern California communities “Santa Susana Disease” or “[Defense Contractor Name] Disease”. Pugnacious push back from the puppets! I have been thinking about the proposed ASTDR study. The most recent Federally funded study of the Santa Susana Field Lab soil shows 450+ radioactive hot spots. Will a paper health study stop radioactively dust and dirt from those hot spots from blowing onto/into buildings and people in Simi Valley? Can a paper health study stop the Santa Ana winds from blowing? Thanks a lot Center for Disease Control. Just let the children and other residents of Simi Valley and other SSFL surrounding communities continue to get cancer and die. It’s important for SSFL area taxpayers to complain about the ATSDR’s study to the leaders of the 2 Executive Branch agencies which “supervise” ATSDR. It’s important to note that they, as well as Members of the House and Senate have their U.S. Mail substantially delayed for security screening. As a result, the best shot at getting a letter to “the bosses” is by an internal email system or a private courier service like Federal Express (whose deliveries are screened as well). Though the House of Representatives is in chaos today, it would not hurt for people opposed to the new ATSDR study to write complaint letters to the Congressional committee members with supervisory authority over CDC/ATSDR’s budget, and for phone calls to FLOOD both Committees’ offices to complain about the use of ATSDR funds budgeted by the Committees for this illegitimate purpose. AND OF COURSE, LETTERS SHOULD BE SENT TO SENATORS FEINSTEIN AND BOXER, COMPLAINING ABOUT THE WASTE OF FEDERAL FUNDS ON THIS STUDY. ALSO, MOST IMPORTANT, BECAUSE HE IS UP FOR RE-ELECTION IN A ‘PURPLE’ DISTRICT, PHONE CALLS SHOULD FLOOD THE OFFICE OF CONGRESSMAN STEVEN KNIGHT, (R-Palmdale) whose D.C. phone number is (202) 225-1956. Also if you oppose the ATSDR study, you can email him at the House’s internal email system (available only to constituents) at https://knight.house.gov/link/email. Calls to the Congressman’s Simi Valley area office would create pressure on him as well (805) 581-7130. @All: You would think that ATSDR’s stumbling plan to invent a hoax study had fallen on its face judging by the 4-1 vote by the Ventura County Board of Supervisors today telling them to take a hike but no, ATSDR is steaming full ahead. The supervisors’ decision and letter to ATSDR follow. Now the question becomes will the demands of the people of Ventura County be trumped by the feds, state and polluters, joined at the wallet? 2. Request the CEO’s Office to communicate our position to our legislative representatives. were released in 2006 and 2007.
cleanup to the most protective standards, equivalent to a cleanup to background. government break its cleanup commitments. epidemiological investigators involved in the SSFL issue prior to accepting the petition. reversal of its cleanup commitments. The Ventura County Board of Supervisors urges you to reverse the recent ATSDR decision. Once again, Michael you hit it on the nail. Thank you so much for exposing this info. I oppose ATSDR’s coming in – they have terrible history of claiming no pollution which is what Abe [Weitzberg] (consultant for Boeing) wants them to claim. This site is polluted! We should never put a fox to guard the hen house. There have been studies over 25 years – this site is contaminated and needs to be fully cleaned up. Stop Boeing’s lies. Even Boeing’s own info talks about 1 in 3 getting cancer. It is time that Boeing, NASA, and DOE clean up all of their toxic waste. A Federal lawsuit to stop ATSDR? Can’t think of a legal theory which would survive an early attack by ATSDR’s lawyers (U.S. DOJ). A California court lawsuit against ATSDR? It would get removed to Federal court with same result. Yesterday I went back and read the two drafts of SB990 which went through the California Legislature, which the Federal court said were unconstitutional. The goal of the law was to take discretion out of the hands of DTSC’s decision-makers, and put it in the hands of the Legislature…who had delegated toxic-remediation decision making under California law to DTSC in the first place. I still think that the Legislature yanking on DTSC’s leash was legitimate. In essence, it was just worded wrong, as described below. The slight complication is that sometimes CalEPA (DTSC’s superior agency) acts under delegation of authority from the U.S. EPA under a written agreement. I doubt the U.S. EPA intended to allow the Legislature to step into the shoes of CalEPA in making that agreement. As a result, if the Legislature wanted to legislate remediation standards, those standards had to be articulated in terms of California law, which can be tougher than Federal law, because remediation requirements generally are part of the States’ police powers reserved under the 10th Amendment. Yesterday I spent an hour re-reading parts of Boeing’s deposition of R.B., a high level DTSC employee who, from prior experiences, I thought was a complete, power-mad jerk. R.B. was at the time of his deposition both DTSC’s lobbyist at the California Legislature and the remediation project director for Santa Susana Field Lab. 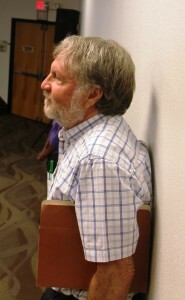 He was DTSC’s “point man” on SB990. That man’s deposition is full of nuances which could be discussed at another time. However, in R.B.’s deposition Boeing’s lawyers were going at a key point: DOE had signed an agreement with a California agency other than DTSC, sometimes delegating DOE’s power concerning nuclear remediation generally, to that other California agency. My thought was, again, that DOE never intended to delegate its nuclear remediation authority to the California Legislature let alone DTSC. I then looked at the wording the FIRST DRAFT of SB990. As worded, it had a shot at being Constitutional under Federal law, based on what many California Legislature staff members who write legislation have told me over the years. However, before that FIRST DRAFT of SB990 even got to the floor of the State Senate the first time, SB990 was re-written. SB990’s SECOND DRAFT’s wording violated all of the rules of Constitutional legislative drafting. I don’t know why that happened. I don’t know who was involved. I don’t know if then Senator Kuehl was warned there were big problems with that SECOND DRAFT’s wording. She graduated from Harvard Law School, so she might have even remembered the drafting principles she was taught in her Legislation course, which is standard first year law school fare. Or Senator/Supervisor Kuehl may have relied on somebody else’s legal advice, never a good thing for a lawyer from Harvard to do. The bottom line with SB990 is that the law’s supporters good intentions overwhelmed lawyer-like common sense. Looking at the legislative history from a detached outsider’s point of view, SB990 was DOA when it first arrived on the California State Senate floor and never improved in terms of its constitutionality throughout the legislative process. Anyone who thought otherwise was mislead….by whom I don’t know. In 2015, Governor Jerry Brown made HIS intentions about SSFL clear in appointing Barbara Lee as his new DTSC Director. 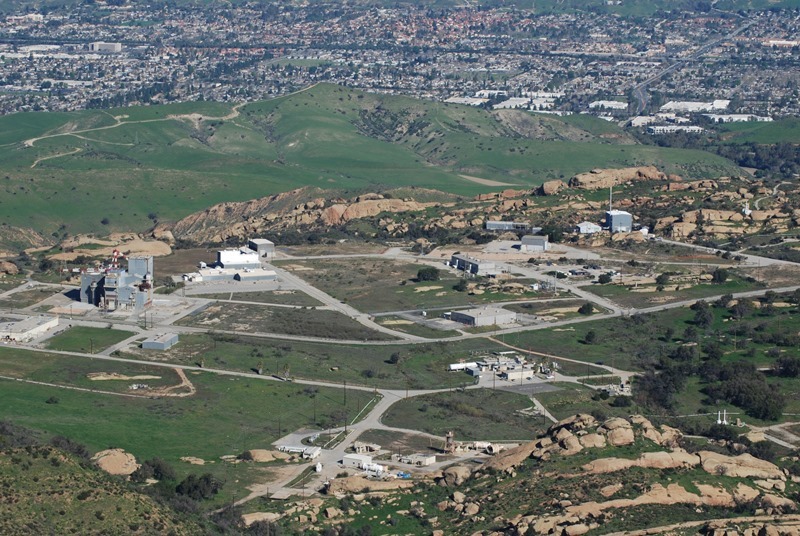 Director Lee has made her marching orders clear in response to both the ATSDR controversy and in response to the NBC4 Los Angeles stories on the Santa Susana Field Lab’s history. Governor Brown and California’s Senators have accepted very large campaign contributions from Boeing in the past. So has at least one Democrat candidate for Senator Boxer’s seat. As a result, it will take a goodly amount of lobbying of the Governor and California’s 2 U.S. Senators, as well as lobbying of both Democrat candidates for Boxer’s seat, to “turn the freight train around” in terms of STOPPING DTSC and DOE from acquiescing in the levels of remediation Boeing wants. Similarly, Congressman Steve Knight was a big helper to Boeing on state issues when he was a California Assemblyman. His relationship with Boeing has been far more quiet since he became a Congressman. He does need Democrats and Independents votes to retain his Congressional seat. I found a Boeing pdf of its 2015 campaign contributions and it shows a California contribution to “Steve Knight for Senate”. Hard to know if it’s a mistaken contribution to a State Senate race, or if Boeing thinks Knight is going to run for Barbara Boxer’s Senate Seat. Knight may not even know about the contribution! While Simi Valley’s former Congressman Buck McKeon loved Boeing, and loudly said so, former Congressman Elton Gallegly was far less effusive, and is said to have helped form the SSFL Work Group. So SSFL area residents sure should be writing letters to their Congressman, Steve Knight, and flooding his offices with phone calls demanding that he step in and derail the half-assed remediation plans which DOE and DTSC appear to be ready to approve. Phone calls are far less easy to ignore than emails. Who knows, he may actually be afraid that SSFL is an election issue. The reason DTSC, rather than DOE, appeared to be getting to decide the level of remediation of radioactive contamination is a political one, not a legal one. Since DOE and its predecessor agency (i.e. the Federal government) are ostensibly responsible for the existence of that radioactive and toxic contamination on private land by a defense contractor, in the old California-DOE agreement DOE seemingly ceded its decision making to the state because DOE has a moral conflict of interest. Assuming DOE still cedes that decision making power by moral/political delegation through the Federal-state political process, that is legitimate assuming that DOE is still willing to do so…which Boeing and the judges in the SB990 case insisted cannot be done by a mere California law. So political pressure on DOE and California’s Congressmen and Senators, and on President Obama, for remediation-to-background is more than appropriate NOW. As to the California Legislature yanking on the California Executive Branch’s leash in terms of SSFL remediation-decision making with respect to “properties in California which are both radioactively and TCE contaminated”, replacing SB990 with a new law, I think the Legislature DOES have the power to do it. However, unlike SB990, a new law passed by the Legislature would have to be applicable to ALL such double-contaminated properties in California, and have the same remediation standard for all such double-contaminated properties. The new law’s enforcement would still be subject to DOE’s acquiescence. The remediation standard could be “clean up to background” for every such double-contaminated property. Such a new law could be enacted if Los Angeles County and Ventura County residents lobbied it through, assuming their anger and voting power had more effect than Boeing’s campaign contributions. However, voters would have to get on it right away to get the SB990 replacement passed ASAP to handcuff DTSC’s and CalEPA’s morally bankrupt management. The new California law, if passed, would have to be worded as an urgency measure to go into effect right away…a fatal flaw in most California legislation when it is politically neutered by having it not become effective until the following January. As to such a new law, Governor Jerry Brown would have to be convinced that protecting his legacy is important to him. Jerry Brown, who used to be environmentalist-Democrats’ hero in the 1970’s, and who is reviled by those of them left in California today, would have to be convinced that “protection of his legacy” and protection of the economic interests of the hundreds of thousands of residents of Simi Valley, Chatsworth, West Hills, Bell Canyon, Oak Park and Thousand Oaks supersede the importance of Boeing’s past and future campaign donations to Democrat candidates. For more insight on Governor Brown’s current thought processes, go to sactownmag’s website and look for the 2015 article on his wife Anne Gust Brown. It looks to me that Mrs. Brown is an equally important player. The key point to be made to Gov. & Mrs. Brown, and to all other California and Federal politicians is that, in addition to the public health costs of widespread cancer in the communities surrounding SSFL, the dollar value of the houses in those communities, WILL substantially decline, as compared with values in similar suburban communities in other parts of the L.A. Region. Careful real estate brokerages are already thinking about how to ramp-up their disclosures to prospective home buyers to protect the real estate brokers behinds from being sued for “breach of fiduciary duty” in failing to properly warn potential residents of those communities. The destruction of fair market value of SSFL communities’ homes not only affects the home owners, it will ultimately affect the real estate tax revenue to Los Angeles County and Ventura County if the price-at-resale of those houses stalls or declines. My friends in the San Gabriel Valley tell me that the fair market value of the homes around the now closed BKK landfill have plummeted in comparison with the fair market value of similar homes not around BKK. The only way not to destroy the fair market value of homes in those SSFL surrounding communities is to remediate, remediate, remediate. Forcing a change in Governor & Mrs. Brown’s view of the “Rocketdyne radioactivity problem” and getting new legislation passed before the amoral hacks at DTSC act on remediation standards is do-able, but as a former field deputy for Gov. Nelson Rockefeller in the 1970’s used to say to me “It’s a tall order”. People who live in the communities around the SSFL either need to give up or fight as if their lives and their fortunes depended on it, BECAUSE THEY DO. There IS merit in “community organizing” when its something this important from a public health and economic point of view. Well, here we go again! More lies, cover ups and “health studies” ….ANYTHING to help Boeing save millions of dollars by not having to remove the cancer causing radionuclides and toxic chemicals from the soil of the SSFL. Now it’s the ATSDR that will, supposedly, be spending millions of dollars to “study” the SSFL all over again, and, based on their reputation, we already know that they will find that no harm to surrounding neighbors or communities has ever been done. No harm done by the partial meltdown at the SSFL, along with the spills, destructive shooting of those storage barrels, into the open air and wind, of numerous cancer causing contaminants…and, oh yes…those uncovered burn pits? No harm done? Give us a break!!! Perhaps Boeing’s massive truth dodging and money saving manipulations are especially horrifying and upsetting to me, since I spent over 30 years as an LA County Deputy Probation Officer working, non-stop, to get juvenile delinquents to become accountable and take responsibility for their own behavior, instead of blaming others…BEFORE they turned 18 and landed in jail……..apparently NOT a concern for Boeing. And now I am also wondering about the DTSC. TALKS! Taking responsibility for cleaning up the SSFL to an Agricultural or Rural Residential standard that can save lives in the future, is apparently not on the Boeing agenda, and of no particular concern to them…..as based upon their deeds…..NOT their words! 1978 Glendale Savings & Loan lends a lusky homebuilder 14.2 Million to remove top soil. Bust incredibly tough clay of Montgomery Ranch hills creating 90 home pads. Clay is beyond tough, there are cost overruns. Big tract houses plans slashed to save construction costs. Extra fireplaces and covered porch slabs gone. Seconds installed, blemished bath tubs, streaky cabinets, cheap tile. Santa Ana winds of Fall blow east to west, covering freshly cut clay and houses with Simi Dust. 1979 81 big ghost houses no one home. No freeway connection to the 405. Santa Ana winds of Fall blow east to west, covering clay and ghost houses with Simi Dust. 1980 Glendale panics. FSLIC examiners shake their heads. Why did you do that? Only 1 in 4 big ghost houses have souls inside. Hostesses in model homes smile bravely. Tarantulas and black widows move in, oblivious to Santa Ana winds of Fall blow east to west, covering clay and ghost houses with Simi Dust. 1981 Recession hits. FSLIC shouts Why were you so stupid? Glendale panics. Sell the ghosts! LA Times Saturday. $80 per foot. $13,000 down, $10,000 landscape rebate. Wrap around mortgages. Glendale moves money from left pocket to right. 27 year olds sitting upstairs on fresh new carpet balcony, disbelieving at dream house, watching sunrise, feeling rockets roar, watching exhaust cloud. FSLIC can’t see the ghosts. Santa Ana winds of Fall blow east to west. Hard. Halloween fire near Hummingbird Ranch. Watch the fire whipped by Santa Ana through east window. Dust and dirt blowing across big old farm field, peppering east windows with dust. Tap, tap, tap, tap, tap, tap. Simi Dust. No reason to be afraid. 1982 Spring has sprung. Joy, a baby on the way! HOA: Use up that landscape allowance or else. Digging up east side front yard clay. Olga from the Volga, big baby belly, small shovel. Santa Ana winds start to blow, strong enough to snap crape myrtle’s head. Eucalyptus street tree down, blocking driveway. December 2, beautiful sunny morning. Modesto Ash trees golden yellow glow. Looking at “Gold Covered City” and Rocketdyne rocks riding up the Simi Pass. Northridge Hospital. Hello baby boy. You are our blond Ukrainian prince, living in the New World, house in hills, toys piled high, tricycle waiting. December 7, Santa Ana winds blowing. Hard. Tiny prince riding in car seat, car shaking going down Simi Pass. Cannot see Rocketdyne. December 8, Santa Ana winds still blowing. Harder. Prince is sleeping. Bubbe and Zayde pacing, Will roof blow off? December 9, Santa Ana still blowing. Even Harder. Simi Dust blowing across big old farm field, peppering east windows with dust. Tap, tap, tap, tap, tap, tap. Simi Dust coming in cracks around windows. Simi Dust coming down family room chimney, into bassinette. Bubbe dusting, kvetching. December 10. Santa Ana still blowing. Even Harder. Hours of ripping noises on roof. Wind howling Flee! Wooden roof shingles flying westwards. No reason to be afraid. 1983 Man of house very sick. Horrific pain in hands and feet. Rheumatoid spondylitis? Guillane Barre? Mysterious immune disorder? Simi Boys from Xerox shake their heads. We are all sick in one way or another. Who is at fault? Santa Ana winds still blowing east to west, across old farm field. Hard as usual. Simi Dust coming down the chimney. Dust hitting east windows. Tap, tap, tap, tap, tap. Life in Simi, have a beer. Still not afraid. 1984 Digging in back yard. Quarter acre back still to plant. Weeks and weeks of dirt up to elbows. Dirt in nose. Blond prince running in yard laughing. Covered head to toe in dirt, so happy. Santa Ana winds return in Fall. Blowing hard, east to west. More Simi Dust. More fires, smoke. It’s just the dragons in the hills. See the dragons’ smoke, feel their roar as the upstairs balcony shakes. Don’t be afraid little Prince. Some day you will slay them. 1986 Louie, Cindy, Mike, Holly, Peggy, Barbara, Ed, Marie. Friends laughing in the living room. Too many houses getting built! Stop the traffic jams on the freeways! We will save the hills! Old time Simi check-bouncer-elite, we know better. Ballot measure, what is that? May meeting at work. Big time Israeli/Beverly Hills developer, wants my bank’s money. Conference room, negotiating hard. Secretary breaks rule, taking while delivering message. 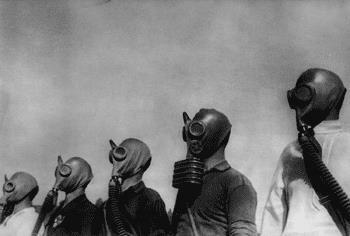 Nuclear disaster in Ukraine. Canadian Embassy on the phone. Hubby’s aunties shrieking in Ukrainian on the phone. Embassyman says they need to come back to Canada. More noise from aunties shreiking in Ukrainian. Israeli adversary, hero now. Talking to aunties in Ukrainian. Telling me what they say. GET US OUT! Fellow Brodsky “I can get them to Przemysl, then to Gdansk.” Money out the door. Israeli gets his deal done. Fall again, beautiful Simi. Time to garden, time to plant. Covered in dirt again. More fires in the Simi Hills. Looks like it will surround us this time. “Don’t worry Mommy, it’s just the dragons fighting and causing the fires. I will protect you.” Simi Dust coming down the fireplace. Flying to Kawaii after election. Miscarriage on the plane, nurse/passenger holds my hand. Ambulance at HNL. What a waste! New Years Eve in Simi. TV newsman wrapping up the year’s news. “The radioactivity first blew north and north east, into Byelorussian Soviet Socialist Republican and into southwest Russia. Then monitoring stations picked up high levels of radioactivity in Sweden, to the north northwest. The wind shifted and blew the radiation south west, into Austria and Bavaria.” Santa Ana winds blowing east to west. Hard as always. Santa Ana roaring, Rocketdyne roaring. Simi Dust coming down the fireplace. 1987 Savings and loans failing. Too many bad real estate deals. Whole Vida Cheddar tract in Simi, houses empty. So sad, the houses are beautiful. How can bank sell them? Who will buy them? Pinecrest Princes, fabulous birthday parties. Forget the clowns. Ponies, elephants. Dr. John renting ranch gigantic ranch at south end of Muirfield. What a guy! Running cattle in Simi’s south hills. We’re riding in the hills, in a jeep. Is that Rocketdyne up there? December coming. The blond Prince needs a big bash for 5th birthday. Must be spectacular. Idea: MISSION IMPOSSIBLE. Hide clues and instructions written on paper, starting at the Muirfield corral, heading uphill on the ranch. Picnic tables and birthday cake at the top of the ranch. 15 boys shrieking, running up the hills, through the dirt. Reading clues. Run higher, higher! Who will find the next clue? Higher, higher! FUN! We are in dragon country! We are at the top of the ranch! The birthday cake is here! The wind is blowing Simi Dust onto the birthday cake. Who cares? Is that really Simi down there? Can we climb up there to find the rockets? 1988 Beautiful Ukrainian orphans for adoption! Blond, blue eyed beautiful baby girls. Take two, they’re free! Except for adoption agency fees. “The undersigned as adopting parent acknowledges that Ukrainian children made available for adoption, and their birth parents, may have been exposed to excessive levels of nuclear radiation. Adopting parent agrees to indemnify, defend and hold the Agency harmless from all loss, cost, liability and expense, including attorneys fees and court costs, in the event the adopted child/children later develop illnesses or genetic defects.” Walk away. But she’s so pretty! Walk away. But she’s so pretty! On the phone with Bubby and Zayde. Walk away. You don’t want somebody else’s trouble. Santa Ana winds blowing east to west. Super hard. Simi Dust coming down the fireplace, covering the dark blue carpet in the family room. Fire in the hills! Don’t worry Mommy, its just the dragons again! This time they’re blowing black smoke right up there near us! I love dragons! 1989 Pregnant again! Finally. Hope it’s a girl. Only 4 months to go. Beautiful June breeze blowing off the ocean. Look how big our trees and bushes are! I worked so hard in that garden…we’ve been here almost 8 years. Time to leave for Dr. Jeff. Just another ultrasound. WHAT DO YOU MEAN THE BABY’S DEAD? How can this be? Maybe the hospital ultrasound will show it’s just sleeping. “Sorry m’am your fetus is not alive.” Crying. Heart breaking. All alone looking out the window at the garden. When will he get here? “Wendy can you pick him up at school? I know. Yes call your dad. Cedars Sinai doctors are the best.” Waiting, waiting. Praying for a kick. Days pass, no miscarriage. All the kings horses and all the kings men, and all the Cedars Sinai doctors couldn’t bring the baby back to life again. Two weeks pass, maybe three. “Yes I know the guys and the clients are grossed out, but I’ve got to be here at work. It’s the only thing which keeps my mind off the waiting.” “No Henley, I can’t be at work today. Don’t you ever listen to me? Dr. Jeff is taking the baby out today.” Thank you Dr. Jeff, I trust you. Thank you anesthesiologist, I trust you. I am drifting off when I hear them talking. “This happens so often in Simi Valley.” Did I dream that? What did it mean? It’s now November. The Santa Ana winds are blowing again, east to west. The wind is blowing hard. Simi Dust is hitting the east side windows. Tap, tap, tap, tap, tap. Simi Dust coming down the fireplace. Simi Dust on the dark blue rug. No big deal. I’m used to it. Simi means “Windy” in Chumash. No Simi means dead in English. Let me get this straight – Boeing is announcing the ATSDR study? Ladies and gentlemen the fix is in. Fifty years of nuclear and aerospace work with accidents galore, spills, radioactive fires and releases and what not, on the top of a hill, at the headwaters of the LA river, surrounded by thousands of people who just happen to have cancers linked to the crap that happens to be on the hill, and Boeing says there is no problem. ATSDR has agreed before and will agree again. And how much will we taxpayers spend for the pleasure of being told to shove off? Boeing and ATSDR can go take a hike. To the Systems Test Laboratory, nice spot for a picnic I’m told. @Stanley Ng: Thank you for summing this piece so succinctly, and many would say, right on the money. Michael, good report….thank you for keeping me up to date. Michael, this link takes you to a picture I gave to you a few years ago….. you did not describe it correctly. This is a picture I took About Sep. 1959 of the men on my crew trying to remove the last broken fuel element in the SRE reactor. It was very dangerous assignment. We men were trying to remove the last broken fuel element….it broke off in the reactor and was stuck half way between coming out of the reactor core. They could not get it to move up or down…it was jammed tight in the reactor and letting radiation leak straight out of the reactor core. It was very high levels of radiation out of the core of the reactor. This is why I took a picture of the men. They had to raise the lead protective shield so they could see under it to see how it was stuck. I took this picture from the control room window looking into the High Bay area. I was being exposed to radiation too. With not being able to pull fuel element out they were not able to cap off the open fuel element hole. 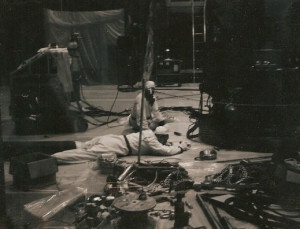 They were not looking down into the reactor core…The were looking under the fuel handling cask and lead safety shield. 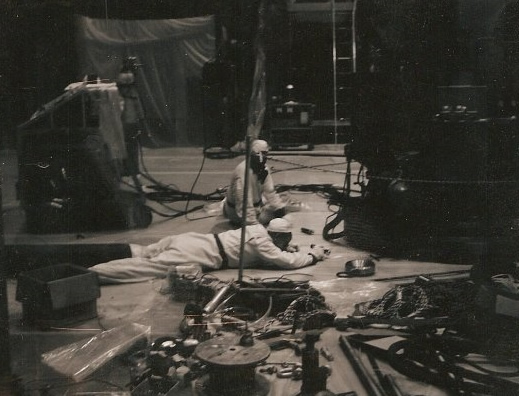 The man laying on the floor was being covered by radioactive contamination coming out of the reactor core. Finally after about an our they were able remove the broken fuel element so they could cover up the open fuel element hole with lead blocks to keep the radiation from leaking out. The SRE building got very contaminated and I helped clean it up. We had to open the large door in the High Bay area to let the radiation out so the radiation level would drop to safer level. This is one of the many very dangerous jobs we did while repairing the SRE Reactor. At the time that fuel element was stuck and radiation leaking out of the reactor there were 81 Uranium fuel slugs laying in the bottom of the reactor core that had broken off of other melted and broken fuel elements. Then we had to drain the reactor core of radiated sodium from those 81 Uranium fuel slugs laying in the sodium. The sodium was taken in 55 gal drums out to the Pond to be blown up and burned. Once the sodium was drained out of the reactor core we were able to see the 81 uranium fuel slugs and broken parts and pieces of fuel elements. Then came the next dangerous job of removing the broken pieces and fuel slugs out of the reactor. The is another story in its self. You can get a Ph.D. in DoubleTalk, just listening to these guys.